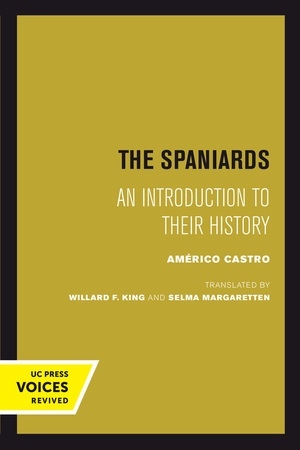 This ambitious book by Américo Castro is not simply a history of the Spanish people or culture. It is an attempt to create an entirely new understanding of Spanish society. The Spaniards examines how the social position, religious affiliation, and beliefs of Christians, Moors, and Jews, together with their feelings of superiority or inferiority, determined the development of Spanish identity and culture. Castro follows how españoles began to form a nation beginning in the thirteenth century and became wholly Spanish in the sixteenth century in a different way and under different circumstances than other peoples of Western Europe. The original material of this book (chapters II through XII) was translated by Willard F. King, and the newly added material (preface, chapters I, XIII, and XIV, and appendix) was translated by Selma Margaretten. This title is part of UC Press's Voices Revived program, which commemorates University of California Press’s mission to seek out and cultivate the brightest minds and give them voice, reach, and impact. Drawing on a backlist dating to 1893, Voices Revived makes high-quality, peer-reviewed scholarship accessible once again using print-on-demand technology. This title was originally published in 1971. Américo Castro was a Spanish cultural historian, philologist, and literary critic who challenged some of the prevailing notions of Spanish identity.